When a media advisory arrived that Berjaya Land Bhd (BLand) was inking a deal with the Penang Turf Club (PNTC) in George Town this week, most reporters were spooked and wondered if the "ghost" of the Penang Global Centre (PGCC) was back to haunt them. The PGCC was a proposed project to be located at the PTC grounds, carrying a gross development value of RM25 billion and to be built over a span of 15 years by its developer Abad Naluri Sdn Bhd, an associate company of Equine Capital Bhd. Abad Naluri bought the land for RM488 million from the club in 2002 and had, among others, planned to include two five-star hotels, a performing arts centre, retail complex, monorail transportation and a world-class convention centre. Following public opposition to the development, which was considered misleading and lacking in transparency with issues such as land rezoning and traffic congestion, along with a host of other concerns, the proposed project was officially declared "dead" after the Penang Island Municipal Council in 2008 rejected it on the basis of the developer's failure to submit the layout plans on time and comply with the council requirements. On Tuesday, Berjaya Corp Bhd founder and chairman Tan Sri Vincent Tan was in Penang to ink a sale-and-purchase agreement between Berjaya Land Development Sdn Bhd (BLand) and Penang Turf Club (PNTC). 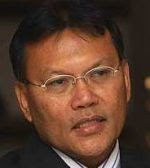 BLand is buying 22.8ha of freehold prime land within PNTC for RM459 million cash, and is proposing to develop a low-density, exclusive, guarded and gated housing development comprising bungalows, semi-detached homes and low-rise condominiums with an abundance of landscape and garden areas to complement the serenity and exclusivity of the surrounding areas. The company, unlike other property developers which have entered Penang in recent times, is set to meet the requirement of building affordable housing units within the same site, although these homes will be located away from the high-end residential units. Tan made it clear to reporters when he was asked if there would be any controversy on the project, that he was not expecting any from those living in the neighbourhood of the PNTC. This he said is because there is no retail component to the proposed development, and the condominium would only include two low-rise blocks. As concerns about traffic congestion owing to an incremental impact of new residents to the area are likely to surface in due time, it would be prudent for BLand to take proactive measures and devise a traffic dispersal system. On its part, the PNTC has to contend with decreasing horse-racing revenues, while doling out large sums in quit rent and assessment in recent times. This is because the present site of the PNTC was originally given by the government for a nominal sum and zoned as an "Open Space". However, this was changed in 2007 to a "Mixed Development" zone, to facilitate the PGCC project. The club is now saddled with paying revised rates and has been making efforts to increase its revenue base. In 2009, PNTC said it was planning to embark on a RM30 million development project to build 25 bungalow units on the fringes of the club, which can be rented out to generate income. Plans for this development is still on the cards, the club's officials said, and it is currently awaiting the necessary approvals to proceed with the project. While BLand has made it clear that Penang has become much more attractive as an investment destination in recent times and the company is on the lookout for other opportunities, there should be no major issues or opposition arising from its planned development on the PNTC grounds. At the end of the day, it is simply a property transaction between two parties, with hopefully no "ghosts" lurking in the shadows. PETALING JAYA: The RM26bil Kuala Lumpur International Financial District (KLIFD) will be overseen by 11 local and foreign consultants appointed by 1Malaysia Development Bhd (1MBD) to push forth the development of the project. 1MDB said in a statement yesterday that the consulting companies were appointed based on their experience and track record in their fields such as sustainability, infrastructure, engineering, landscape planning and traffic management. In March, 1MDB carried out a pre-qualification and request for proposal process through its subsidiary 1MDB Real Estate Sdn Bhd. Among the selected local companies are traffic management consultant Perunding Trafik Klasik Sdn Bhd, quantity surveyor Perunding NFL Sdn Bhd, landscape architect Akitek Jururancang Malaysian Sdn Bhd and land surveyors Jurukur Perpaduan Sdn Bhd and Jurukur ESA Sdn Bhd. The infrastructure engineering consultants are EDP Consulting Group Sdn Bhd and Buro Happold Consulting Engineers, a UK and US consultant which also acts as KLIFD's sustainability consultant. Others include security and risk engineers ARUP Jururunding Sdn Bhd (from Malaysia) and ARUP Group International, a Hong Kong-based company. A consultant from Qatar, KEO International Consultants, was selected as programme management adviser. The appointments are in addition to the two master planners named recently, Akitek Jururancang Malaysia Sdn Bhd and Machado Silvetti & Associates, selected from an international design competition. 1MDB Real Estate chief operating officer Datuk Azmar Talib said that the appointments were based on global practices and that the committee was “thorough and transparent in the selection process”. “Given the scale of the development and its impact on national growth, we seek not just capability and capacity but people who also share our vision for a sustainable and holistic KLIFD and our passion to deliver a Greater Kuala Lumpur,” he was quoted. 1MDB owns the 30.35ha on which the KLIFD will be developed. As one of the entry-point projects under the Economic Transformation Programme, the KLIFD aims to attract financial institutions and global companies to complement other financial centres in the region. The entire financial district is slated to be completed in two decades, with its first phase operational by 2016. Azmar has expressed hopes to integrate the development of the KLIFD with the country's mass rapid transit system which is slated to commence operations in the same year. Azmar added that the selection of consultants for Bandar Malaysia, a KLIFD twin development in Sungai Besi will also undergo the same rigorous process. Mah Sing Group Bhd, a Malaysian developer, rose in Kuala Lumpur trading after OSK Research Sdn Bhd said its first-half earnings beat estimates. The stock climbed 1.6 per cent to RM2.49 at 9:26 a.m. local time after the company yesterday announced a 48 per cent increase in second-quarter profit to RM43.1 million. OSK said in a report today that it raised its full-year 2011 earnings forecast by 13.2 per cent.